Much like with cars, people looking to buy motorcycles often find the used market difficult to resist. Depreciation hits vehicles with two wheels just the same as it does those with four, which makes a lot of used bikes incredibly affordable. Even used, though, motorcycles tend to be fairly reliable and inexpensive to insure. Especially for beginning riders and riders who want to maximize the amount of bike they can get for their money, buying a used motorcycle is often the best way to go. If you’re fairly new to the process of buying a used motorcycle, it can be a little bit overwhelming when you consider how many different bikes are out there and how many directions you could go. Breaking any complicated task down into a series of steps usually helps simplify it, though, so here are 7 steps for buying a used motorcycle. How much you enjoy a new bike is going to depend on how well it fits your lifestyle. If you’re looking to use your motorcycle as your daily commuter, you’re going to want to buy something different than if you intend to use it as city transportation. Bikes that are great fits for either of those two scenarios probably won’t be what you want if you’re mostly going to be riding in the mountains on weekends. The type of bike you buy isn’t the only part of your situation that you need to consider. What’s your financial situation? Are you capable of doing your own repairs? What’s your experience level? Depending on how you answer those questions, you may want to change which motorcycles you look at buying. It’s certainly possible to road trip a standard, commute on a sports bike, or enjoy a cruiser in the mountains, and if it’s worth it to you, there is no problem with doing so. You may also be able to get away with riding a powerful bike without having much experience, and even if money is tight, you might be willing to skimp on meals to work on an unreliable bike you love. It’s just important to go into a purchasing situation aware of how your needs and wants are going to have to be balanced. Getting the most out of your purchase is going to require you to make informed, educated choices, and the best way to do that is to do as much research as you possibly can. At the very least, you want to know what a fair price range is for each bike you’re considering buying, and you want to make sure you’re aware of common problems you’ll have to look out for. If there is a particular part that wears out quickly, you want to know about that. If a bike is notorious for corrosion and rust, you want to know about that. If the one you were initially interested in isn’t the best value for your money or if a competitor fits your lifestyle better, you want to know that. As in most areas of life, the more you know when it comes time to start looking at motorcycles, the less likely you are to get taken advantage of. You’re also more likely to end up being happy with what you buy if you’ve thoroughly researched your purchase ahead of time. Avoid becoming so obsessive that it takes all the fun out of the whole process, but rushing into a decision is a great way to end up owning an expensive garage decoration. In general, you’ll pay more money for a motorcycle at a dealership, but the purchase will probably be less risky. A private party sale will probably save you money, but the risk level is significantly higher. Those aren’t hard and fast rules, nor is one better than the other. Much like choosing which motorcycle to purchase, it’s smart to make sure you know what you’re getting yourself into. If you’re shopping at a dealer, it will be exceptionally important to already be knowledgeable about the bike you want to buy before you walk through the doors. You won’t look like a sucker, and you’ll be more likely to end up paying a fair price. You’ll also already know what a fair price is, so if the dealership is within that range, you’ll know it. If you decide you don’t want to deal with the hassle of a dealership and that buying private party is worth the risk, having done your research will help you mitigate that risk. It will be easier to spot a reasonable seller, you’ll have a better idea of what you’re looking at, and again, you’ll be more likely to get a good deal. Even if you find the exact motorcycle you want for what looks like a steal, it’s incredibly important to make sure that you’re buying something in good condition. You’ll want to visually inspect each bike for worn out parts, rust, corrosion, or cracks, and you definitely want to check the oil. What you feel is also just as important as what you see. Always ride before you buy and if a seller doesn’t want to let you take a test ride, move onto one who will. It’s reasonable for sellers to be concerned that you may wreck their bike and then disappear without paying for it, but if you’re willing to address those fears, it’s entirely reasonable to expect a test ride. On your ride, you’ll want to make sure the major mechanical components are all still in good working order, but how you fit on the bike is equally important. If it feels too big, too small, or too uncomfortable to fix with some minor adjustments, go ahead and find a different bike. You can tailor the riding position on most bikes, but if it’s clearly uncomfortable to ride in the first few minutes, there may be nothing you can do. If you can, consider talking to the seller about taking it to a mechanic for a professional inspection. It will probably cost you $50 to $100, but even $100 is worth the peace of mind that comes with knowing your new purchase is in good condition. Especially in private party sales, the most important document you want to see before you agree to buy a motorcycle is a title. Without a title, you can’t register your new bike. If you’re buying a motorcycle that’s more than 25 years old, though, look up title laws in your state because older bikes may only need a bill of sale to be valid. 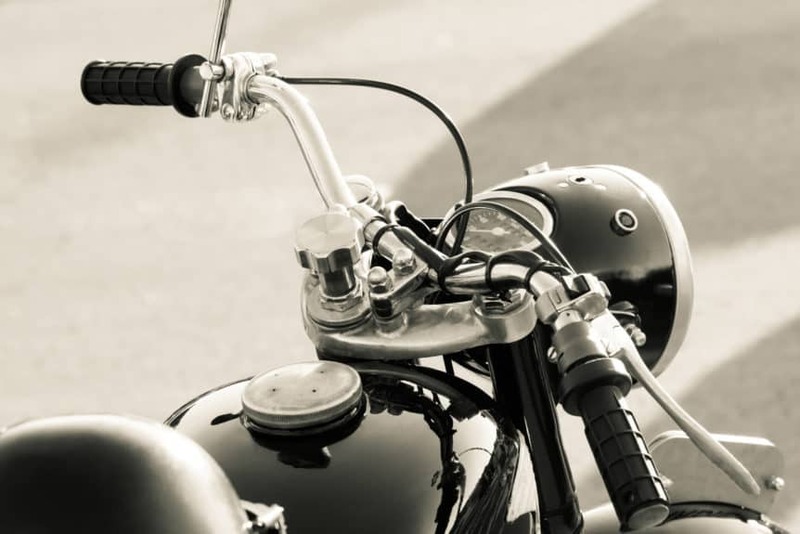 If a bike is new enough to need a title, don’t hand over cash on the promise that a title will eventually appear. The seller’s uncle’s cousin might really have accidentally taken the title to Canada on vacation, and he might really be mailing it back in the next few days, but you need to be able to register and ensure your new bike, and that means physically having a title to change over. You’ll also want to ask to see what kind of service history the owner has on hand. It’s not the end of the world if there isn’t a lot there, but the owner who pulls out a file folder with extensive documentation of service and repairs is more likely to be selling a quality bike. Even if the owner has what looks like the vehicle’s entire history documented, it’s also smart to run a VIN check to give yourself even more information. Whether you’re buying private party or at a dealership, there’s going to be room left to negotiate. A Craigslist seller may tell you the price is firm, but as long as your counteroffer isn’t insultingly low, it probably isn’t. Don’t just throw out an offer or sheepishly ask if the seller will take less than their asking price. Take the time to explain the reasons you’re offering less than it was listed for, and phrase your offer as a statement instead of a question. It’s incredibly important to know what a fair price is because that information is going to influence just how hard you negotiate. It can’t hurt to go lower if the price is already low, but if the seller pushes back don’t get greedy. On the other hand, if the price is fair for a bike in excellent condition, but the bike itself ends up only being in fair condition, you want to walk away if the seller won’t work with you. Once you come to an agreement, make sure everything is signed and put everything in writing, then hand over your money, take your new keys. It’s time to enjoy your new ride. You will, of course, have to arrange insurance for your bike and make sure you register it, but that stuff isn’t exciting. Do you know what is exciting? Zipping up your jacket, strapping on your helmet, and taking that bike out for a ride is exciting. Be safe, and be responsible, but motorcycles are meant to be ridden, and they’re meant to be enjoyed. Hopefully, you were able to find exactly what you wanted, which will lead to many miles and happy smiles over the next few years – until you decide it’s time to buy another one and start the process all over again!